Lowdown: The Marvel superheroes get to fight one another. The second Captain America movie, The Winter Soldier, proved to be more than your average superhero movie by virtue of its very Edward Snowden like message. 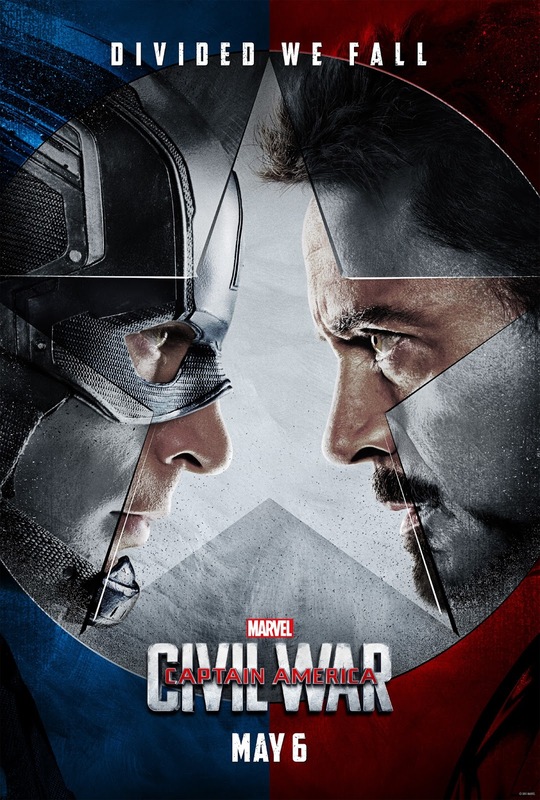 The third movie in the franchise, Civil War, which is actually a direct sequel to the second Avengers movie, aspired to do the same - justify its existence through deep messages - while providing entertaining action, mostly by doing a Superman vs. Batman and pitting the Marvel superheroes against one another. Through bringing Captain America's long lost friend Bucky as some sort of a retired Hydra agent that seem to have committed a serious crime, tension is created. Our Captain wants to make sure his friend gets his right for justice before getting lynched; the UN, annoyed with Bucky's latest adventures as well as the Marvel heroes part in destroying a country at the previous episode, wants to put a leash on our heroes; and certain members of Shield, notably Iron Man, would rather see the latter take over the former. Enter the division and let the fighting begin! A couple of interesting thoughts are thus generated. Our Marvel superheroes, wrecking the world while saving it, offer an analogy to our real world's USA: the country that wages war on anything it feels like, claiming to save the world while doing so, but charging the rest of the world quite a collateral in the process. And then wondering why the rest of the world doesn't like it much. Or the same USA using weapons it has a monopoly on - atomic weapons, once upon a time, and now drones and hacking abilities - to do the killing, all the while pretending the rest of the world would never catch up and cancel out its monopoly. Think about it: the USA is running a very "productive" drone program in the Middle East, Asia and Africa; how would it react if another country, say, Turkey, decided to run a drone attack in the USA in order to kill a person it considers its deadly enemy (for allegedly organising the recent failed coup)? Similarly, in our movie, we find Shield has no monopoly on superheroes; Africa can have its own. The problem with Captain America: Civil War is that it just feels too contrived. You know everything is just an excuse to get our heroes to fight one another. And in order to get there, common sense was left out, the messages take second saddle and get smeared in the process. As for the action, there is nothing we haven't seen before; two and a half hours of the same CGI concepts are definitely an overdose. As ridiculous as it may sound, Civil War misses out on its biggest ticket on the grounds of being pipped to the post by the very meh movie that was Batman vs. Superman. Overall: I found Captain America: Civil War to be quite a mundane and uninvolving movie, a pale shadow of its prequel namesake. 2 to 2.5 crabs out of 5 from me.